KIEV, Ukraine -- Ukrainian lawmakers have voted to dismiss Finance Minister Oleksandr Danylyuk after a public spat with the country's prime minister, in a move expected to raise concern among the country's foreign backers. Ukrainian President Petro Poroshenko (R) shakes hands with parliament speaker Andriy Parubiy after voting on a law to establish an anticorruption court during a parliament session in Kiev on June 7. The Interfax news agency reported that Oksana Markarova, the first deputy finance minister since 2015, had been unanimously approved as acting finance minister. The moves came soon after the parliament passed a bill on a long-awaited anticorruption court, whose creation is a key condition in order for the IMF to distribute more aid to the country. Hroysman on June 6 accused Danylyuk of spreading "distorted information amid our international partners." Meanwhile, Danylyuk alleged that he had been asked to support "political corruption" or to quit. The two officials have been at odds since Hroysman rejected Danylyuk's candidate for deputy minister in charge of tax policy on May 23. 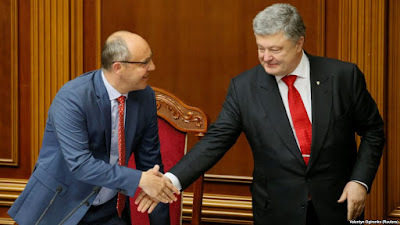 Danylyuk then accused Hroysman of favoring candidates chosen by President Petro Poroshenko's inner circle and wrote a letter describing his grievances to the Group of Seven (G7) leading industrialized countries. Danylyuk, 42, has been known for his anticorruption measures meant to reform Ukraine's fiscal and customs services. Earlier on June 7, lawmakers stood up and applauded in the Verkhovna Rada after a draft law on the Supreme Anticorruption Court won the support of 315 deputies in its second reading. The legislation describes the court as a permanent "higher specialized court" to be located in the capital, Kiev. The court's jurisdiction would be applicable to the entire territory of Ukraine, it also says. "Today we have completed the formation of anticorruption infrastructure," President Petro Poroshenko tweeted after the vote. "I want to emphasize the resolve of the Ukrainian authorities to fight corruption." The draft law, which was presented by Poroshenko in December, was backed by 282 legislators in its first reading on March 1. Corruption was among top reasons that prompted Ukrainians to take to the streets and oust a Moscow-friendly regime in 2014 but it remains a major problem despite Poroshenko's promises to tackle it. International financial institutions have provided Ukraine with billions of dollars to support its stricken economy. The IMF has said an anticorruption court will be a "benchmark" of Ukraine's progress toward Western legal standards, and that it would help ease the release of its loans in the future. The United States has also highlighted the importance of establishing an independent anticorruption court in Ukraine. In a statement issued on June 5, the U.S. State Department said, "the establishment of a genuinely independent anticorruption court is the most important, immediate step the government can take to meet those demands and roll back corruption that continues to threaten Ukraine's national security, prosperity, and democratic development." Western officials say Ukraine will be far better equipped to resist interference from Russia -- which seized Ukraine's Crimean region in 2014 and backs separatist militants who hold parts of two eastern provinces -- if it takes serious steps to combat corruption.